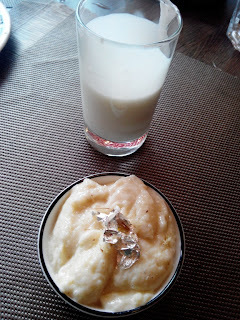 birthday dessert ideas: Tadka Talk- Sunday Brunch and set lunch! Here I was, heading back down the road that had by now become familiar. 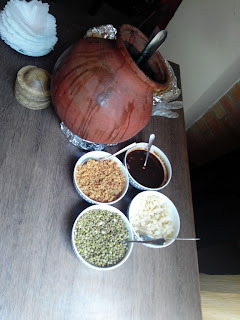 Sunday 12 noon and I was headed to Tadka Talk [Situated behind Chennai Business School, in road opp TCS on Velachery Taramani Link road] for their Sunday brunch. I had been here earlier few months ago and felt the place was alright, there was nothing that stood out or made me want to go back! But then there is always a 2nd time, always a "maybe there is something different" circumstance, which is what led a hunch of us to land here this Sunday! I walked in, grabbed a table and looked around the place waiting for the others to stream in. I noticed there was a change in the interiors, the artwork on the wall and so on. 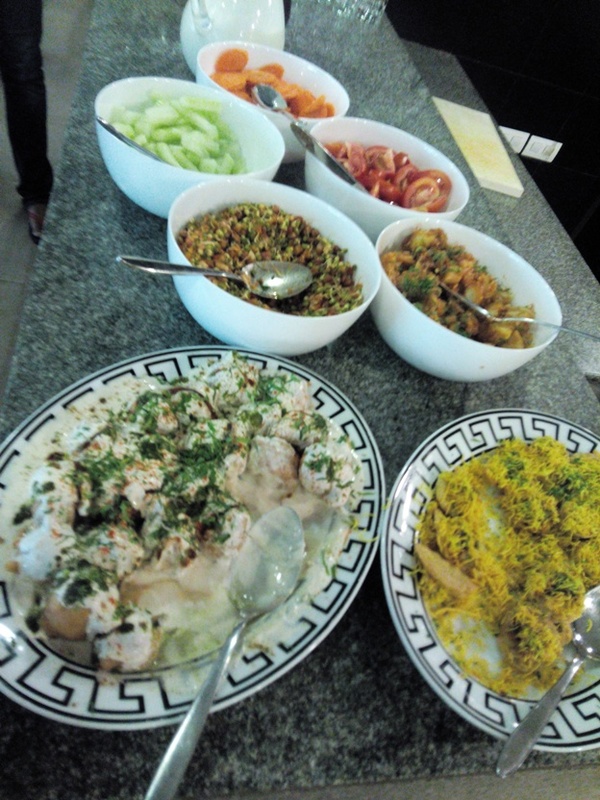 The Brunch was laid out in Buffet format, and there was also a separate counter in a corner for Pani Puri. We started the day with paani puri, and they were good, I did wish the puri had been crispier, maybe they had gone soft since they were kept in open in the AC restaurant. 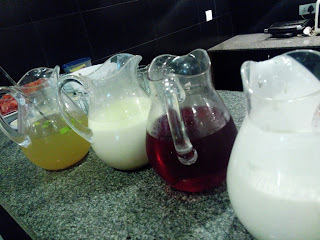 Moving on, I grabbed a glass of Lassi [kesar pista wali lassi] and then tried the cranberry juice. Also sipped some Shikanji which was very good, quite refreshing! Hunger bells began ringing in our bellies and we made a beeline for the starter section- there was a hariyali tikki [1st batch was very good while 2nd had overdose of salt], malai gobi [which was dunked in mustard sauce], paneer tikka [good], mirchi bhajji [I died and spent a good half hour in hell after the 1st bite, normally we make this with the light green big chillies, but here they had used regular green chiliies with seeds and all , which led to my state] there was also an assortment of bhajis [potato and few other veggies]. 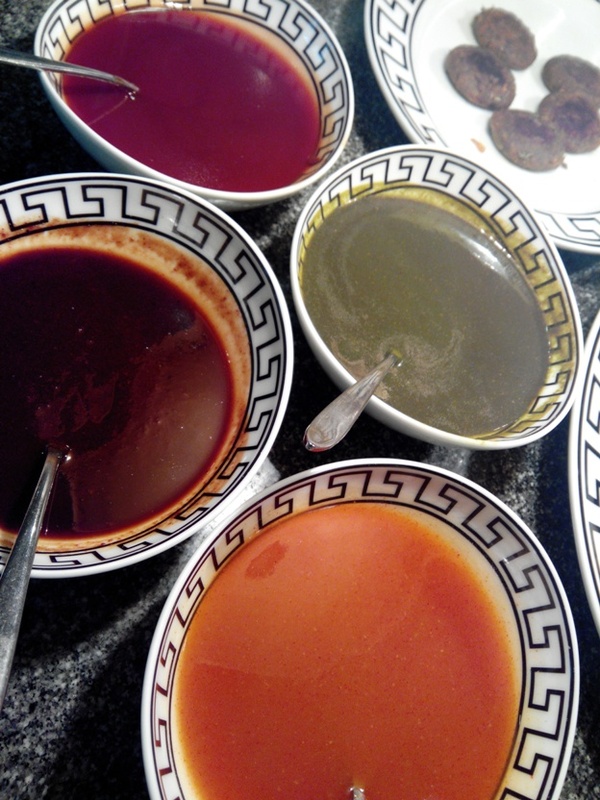 These were served alongside sweet chutney, spicy sauce, tomato ketchup and mango chutney. I braced myself for the maincourse and went ahead and asked for a few Indian breads [naan/kulcha] and took a spoon of the side dishes- Aloo capsicum, kadai paneer and kadi pakoda. 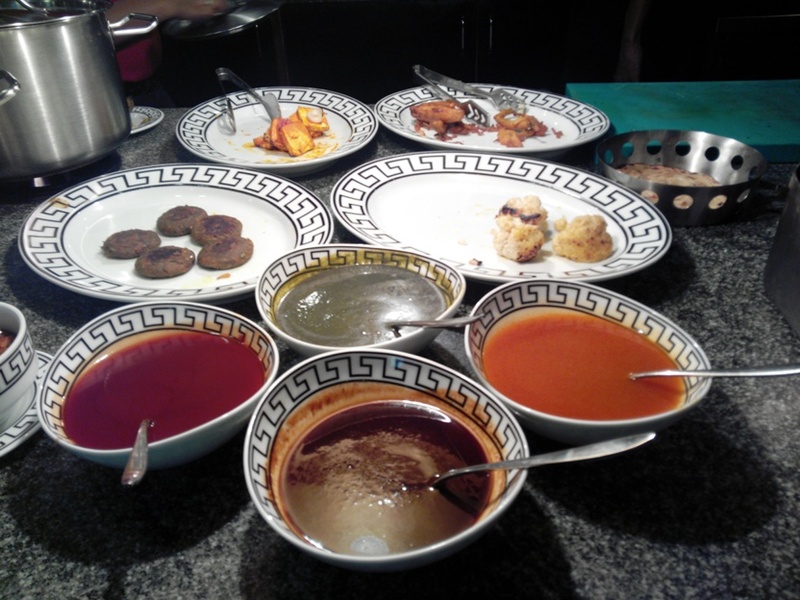 I quite loved the kadi pakoda side and had it with a hot naan. Did take a spoonful of the Peas Pulao, but felt it was tad oily and veggies were overcooked. Since am not a big rice eater, I went ahead and tried the Kulcha. There was also pickle, a boondi raita on the menu. I was tired, hadnt sleep and all I wanted to do was get back home and crash! 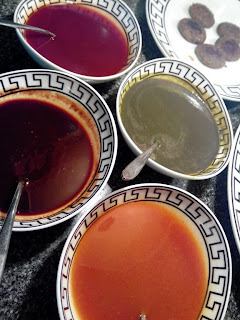 But not before trying their desserts- had a bite of the Gulab jamun which was very good, and also tried the Phirni- taste was good, but texture was funny [almost custardy, like they had added gelatin]. 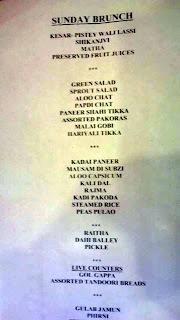 Somewhere during the brunch, we were told they had a set menu lunch for Rs199/- and a sample plate was shown. 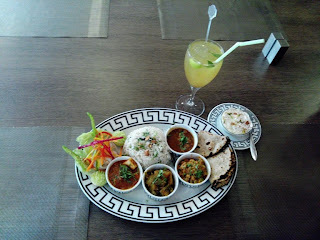 it looked good enough, infact I have realised that most times the set lunch looks small but is more than enough.. I had had a crazy night and so wasnt really myself, which when combined with barely any sleep showed in my eyes and overall feel of the day. Friends infact commented that I was withdrawn, quiet and dint spend much time yapping with them. I wish the food had perked me up, but alas.... Looks like this will be my 2nd and last visit to this restaurant. Plus, let us not forget the distance and time it takes from home!! I request the chef to relook at the recipes, get the staff to follow it to the dot if they want the salt/flavours to be consistent. Tadka Talk is located in the narrow lane right opposite TCS Velachery, it is behind Chennai business school.